This article was originally published by Catholic New World. 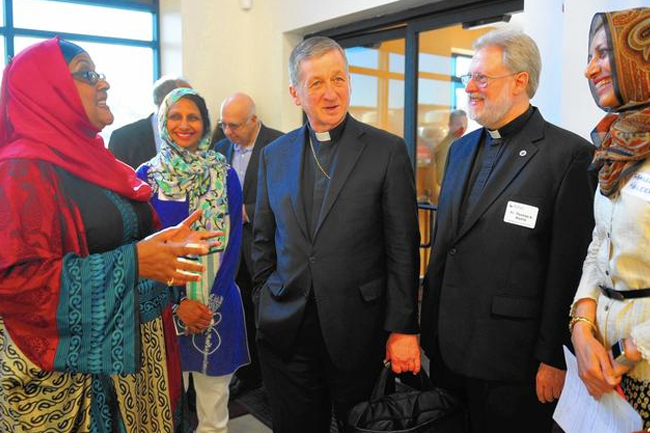 When members of the local Muslim community gathered June 27 to break their Ramadan fast for that day, Archbishop Cupich joined them. The dinner, called an iftar, was hosted by the Council of Islamic Organizations for Greater Chicago and the Zakat Foundation of America in Bridgeview. This was the 19th annual Catholic-Muslim iftar. Cardinal George regularly attended each year and Archbishop Cupich continued the tradition this year. Two speakers addressed the gathering of about 100 people on the topic of Islamophobia and what can be done to combat it. Afterward the community prayed and the Muslims who were gathered broke their fast, which began when the sun rose that morning at 3:30 a.m. and ending after the sun set at 8:30 p.m.
Ramadan, which is celebrated during the ninth month of Islam’s lunar calendar, began the evening of June 5 and ended at sundown July 5. Muslims traditionally believe the Quran was revealed during this month. When Ramadan falls during winter months in the United States, the fast is shorter than when it falls during the summer months, especially June, when the longest days of sunlight occur. Archbishop Cupich addressed the gathering at the start of the event. The archbishop said he is “personally committed” to working together with the Muslim community through his work as co-chair of the U.S. Conference of Catholic Bishops’ National Dialogue Initiative with Muslims. During her remarks, Rita George-Tvrtkovic, associate professor at Benedictine University, said Catholics can help combat Islamophobia by purifying the collective memory, welcoming strangers and persevering in friendship with Muslims. These are simple but intentional attitudes or habits, she said. In his remarks Azam Nizamuddin, adjunct professor in Loyola University’s theology department, offered his own three suggestions for combatting Islamophobia: reminding and reaffirming the commonalities in Catholicism and Islam; Catholics recognizing the spiritual and religious importance of the Prophet Muhammad; and Muslims joining with Christians to combat secularism.